The 2nd Amendment to the Constitution of the United States of America secures the right of citizens to bear arms. Specifically it states: A well regulated Militia, being necessary to the security of a free State, the right of the people to keep and bear arms, shall not be infringed. The left wants to eliminate guns from every law abiding citizen because guns are dangerous. Unfortunately, this leaves guns only to criminals. Not a very smart approach to eliminating a constitutional right. A right that has nothing to do with the role of guns in 18th century life. The Founders knew that throughout history, government overreach, as Britain did to their colonies and without the ability to defend themselves, is unrestricted. Give a look at public opinion in Gallup Polls on guns. Give a look at the way law abiding citizens use guns to defend themselves at Armed Citizen. We don’t know the motive for the Las Vegas shooting. But we do know why it happened. Should Kids Play With Toy Guns? In 2018, there were 27 active-shooting incidents in 16 states, according to new FBI data. Active-shooter incidents around the U.S. fell slightly last year, but they remained at the second highest level since 2000, according to new data from the Federal Bureau of Investigation. Deadly incidents in 2018 included the shooting at a Parkland, Fla., high school, the shooting at the Tree of Life synagogue in Pittsburgh and the Borderline Bar and Grill shooting in Thousand Oaks, Calif. In total, there were 27 incidents around the country last year, leaving 85 people dead and 128 wounded. That compares with 30 shootings in 2017, the deadliest year in the FBI’s records. 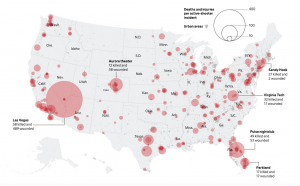 Between 2000 and 2018, there have been 277 active-shooter events, which have killed 884 and injured 1,544, according to the FBI. These shootings have taken place in 44 states and Washington, D.C., in churches, workplaces and neighborhoods, and at all hours of the day. the FBI began tracking active-shooter events to develop new ways to prevent, prepare for and respond to these incidents. The agency also compiled some historical information back to 2000. The bureau defines an active shooter as “an individual actively engaged in killing or attempting to kill people in a confined and populated area” with firearms. In some of the incidents the FBI includes, there are no casualties. By examining all of the events, the FBI said it has found that many shooters signal impending violence before the attack. “Shooters rarely ‘just snap,’ and it’s rare that no one saw it coming,” said Pete Blair, executive director of the Advanced Law Enforcement Rapid Response Training Center at Texas State University. “They plan these things out over an extended period of time, display troubling behavior, and make threats on social media.” These behavioral patterns have shed light on how ordinary citizens and law enforcement can respond to future attacks and even how they can intervene before they happen, said Mr. Blair. The bureau hasn’t identified race for all shooters. In an FBI analysis of shootings from 2000 to 2013, the racial breakdown of the shooters closely mirrored the demographics of the country. What Would Have Helped In New Zealand? Why Do House Democrats Push "Universal" Background Checks When They Admit They Don't Work? What Lurks Behind "Universal" Background Checks?